You’ve worked hard your whole life. You’ve done your best to do right by your family, keeping a roof over their head, food on the table, and love in everyone’s lives. But when you’re gone, what will be your legacy? Sometimes we don’t think about what we’re leaving behind, and who will help our loved ones sustain all we’ve worked to build together over the years. Smallwood Insurance Agency in Maryland can answer your life insurance questions to ensure the best protection. Let’s start with a simple number: $11,000, the average cost of a funeral in the United States. Given that many families these days don’t have the money in the bank for even a simple emergency, the cost of a funeral alone could be ruinous. Factor in the hidden costs — a loved one’s lost income, our own time lost to grief, legal and estate issues, and much more — and the end of life is frightfully expensive. However, there are other benefits to life insurance. If you’ve spent your life building wealth to pass on to your heirs, life insurance is a key component of careful estate planning. It protects your wealth and investments, and can itself be a means of accumulating tax-deferred wealth. There are three types of life insurance, each with its own benefits. Term life insurance is taken out for a set period of time. That term may be as few as five years, or as many as thirty years. Costs are typically lower than whole life or universal life coverage, but this comes with caveats. You may well outlast your policy, payments are typically dispersed as a lump sum, and should you choose to renew at the end of the term, your premiums are likely to be much higher. Whole life insurance comes at a higher price than term life, but offers certain advantages because of that. It doesn’t come with an end date, and — importantly for some individuals — it builds cash value over the life of the policy. Like whole life insurance, universal life insurance comes with higher premiums than term life insurance, but those higher premiums come with lifetime coverage. It differs from whole life insurance as well, however, insofar as the premiums and attendant coverage amounts may be adjustable over the lifetime of the policy. The information and definitions laid out above barely scratch the surface of life insurance. You are not choosing a policy for yourself, but for those you leave behind, after all. An insurance agent can help you navigate the multitude of questions and issues that come with choosing the right life insurance policy. Insurance overlaps with law, estate planning, and a number of other areas. Choosing the right coverage means looking past your present circumstances to consider your long-term goals. Expense should not be the sole determinant. Therefore, your insurance agent will weigh your individual circumstances, needs, and financial goals for those you’re leaving behind. As with your home and auto insurance, whole life and universal life insurance policies can often have riders attached. Often called accelerated benefit riders, these allow you to use equity built in the policy during your lifetime under certain circumstances like a nursing home stay or a terminal illness. As you’ve no doubt deduced, life insurance helps in other ways as well. Your medical history may make certain coverage or riders more advisable. If you have a special needs child whose long-term care is a concern, you should also choose your policy carefully. Your insurance agent will help you weigh these and other important considerations as you make your choice. The ease of access and number of options available to research and purchase life insurance hasn’t removed many legal or financial questions or hurdles. 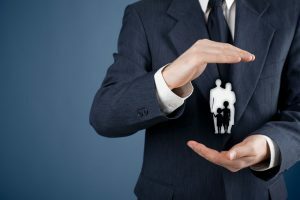 Remember, a good Baltimore area insurance agent isn’t just helping you choose a policy; he or she will also be a helping hand during a difficult time for you or your family, and will be a trusted advisor and advocate when the time comes to navigate the policy as it relates to rebuilding life and moving forward. That’s why we suggest contacting Smallwood Insurance Agency in Maryland for an insurance consultation and your insurance needs; competence — and compassion — matter.